Today, Node.js offers one of the most innovative solutions to building servers and web/mobile applications. Its single-threaded event looping and asynchronous, non-blocking input/output processing feature distinguishes it from other runtime environments. Its scope is increasing fast with valuable contributions from developers’ community and other technology giants. Right now, several performance-driven frameworks are being developed using primary principles and approaches of Node.js. These frameworks have extended the functionality of Node.js to a great extent and have also built newer features. 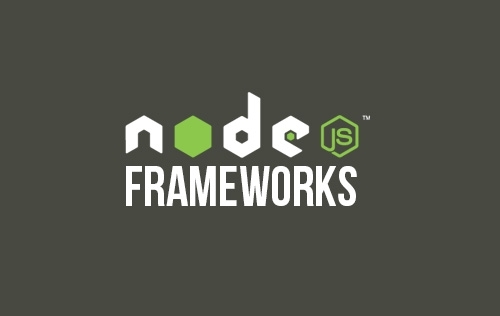 In this article let’s have a look at the frameworks associated with Node.js so that you can choose the one you like. Express is a minimal and flexible Node.js web application framework that provides a robust set of features for web and mobile applications. With a myriad of HTTP utility methods and middleware at your disposal, creating a robust API is quick and easy. Express provides a thin layer of fundamental web application features, without obscuring Node.js features that you know and love. Many popular frameworks are based on Express. Sails is the most popular MVC framework for Node.js. Sails makes it easy to build custom, enterprise-grade Node.js apps. It is designed to emulate the familiar MVC pattern of frameworks like Ruby on Rails, but with support for the requirements of modern apps: data-driven APIs with a scalable, service-oriented architecture. It’s especially good for building chat, real-time dashboards, or multiplayer games; but you can use it for any web application project – top to bottom. Hapi.js is a powerful Node.js web framework for building APIs and other software applications. The framework has a robust plugin system and numerous key features, including input validation, configuration-based functionality, implement caching, error handling, logging and more. Hapi.js is used for designing useful applications, such as Postmile, a collaborative list making tool. Besides, it is used for providing technology solutions by several large-scale websites, such as Disney, Concrete, PayPal, Walmart and more. Derby.js is a full-stack MVC framework built for establishing a more solid routine towards creating modern web applications without the need to write complicated code. With Derby you can easily build real-time applications that will run simultaneously in the Node.js server and the browser. The Racer Engine that Derby enables for developers to use is a powerful way of synchronizing your browser, server and database data in real-time amongst all three mediums, enabling you and your app users to experience a true real-time experience. Racer supports offline usage and conflict resolution out of the box, which greatly simplifies writing multi-user applications. Restify places special emphasis on debugging and profiling so that you can drill down and optimize the performance of your server. DTrace is well-integrated and supported to make it possible to watch what happens and when it might go wrong. Restify is available from GitHub under a very basic license that requires little except a notice of copyright. Web and apps development landscape is changing very fast and developers are shifting to frameworks aiming at quick and clean project delivery. The biggest plus of using node frameworks is that they provide high level readymade structure and you can focus on scaling your application instead of spending efforts in building and defining the basics. Let us know your experience with Node.js frameworks via comments. Perhaps there are any «new comers» that deserve our attention? Next postIs Java out of business?